Chemical projects, culture, news, and supplies. Unfortunately, you’re looking at an archive of projects I worked on and/or completed. I’m leaving this all up for now for historical purposes, but if you want to see the latest things I’m working on, Chemhacker isn’t the best place any more. 1) “Chemhacker” doesn’t really describe me. I work on a lot more things than just chemistry and science, and I found the title to be stifling to blog under. 2) “Chemhacker” kinda came to mean that STM project I stopped working on quite some time ago. I stopped working on it because STMs are really difficult to do well and I found other problems that interested me more, and so I moved elsewhere. It’s been far too long since I’ve posted here, and the more time it was since that last post, the harder it became to post here. So I’m just going to start again. Mostly what happened is that I got stuck on some very frustrating bugs with my new hardware design and it took far too long for me to ask for help, so I lost all motivation to work on this project and found other shinier things to play with. I’m now past that hurdle, and I think I have a way to keep motivation and progress going in the right direction. I’m going to have a weekly or so meeting where I can ask for help and people can ask me basic questions about my designs, helping me to fix problems as they come up, and readdress all my basic assumptions. This is basically what most advisers do for their students, keep them on task by asking questions and act as a sounding board for problems. Maybe that’s something that could/should be used more widely in at-home science arenas? Another inspiration for me is that ZeFrank came back. My current favorites are this classic motivation, and this brand new motivation. Following a series of discussions with my analog adviser (hi Steve) and my physics adviser (hi Lee), I’ve started working on version 0.4 of the electronics (now with actual theoretical chance of working!). I received the (painfully small) surface mount parts from DigiKey and Newark, and managed to solder them to SMD-DIP adapters for breadboarding. Arduino ints only go to 2^15, that is a problem when dealing with 16-bit DACs. My new DAC’s “write” command only means here’s some information, not do something with the information I’m giving you. Bart from BuildLog sent some makerslide, a 400-step stepper motor, and other amazing things as part of his Makership project so I can build a solid linear actuator for the rough approach. Individuals: Nikos G., pdp7, T. Joseph N., David C., Bruce G.
This is an experiment with opening my research notebook to the web. I’m keeping my notes in an Evernote notebook, but I’m going to post lightly edited (i.e. remove personally identifiable information from people I talk to unless they give me specific permission). Keep in mind that these are my raw thoughts for the past two months, with no editing for accuracy. Follow these notes at your own risk. * L. M.’s STM had a higher cost (and precision) than the chemhacker STM, but a lot of his designs and thoughts can be adapted to fit a cheaper device. Also, he’s excited by the idea of an open source STM project. * * 10 bits gives ~17.59 mV/step which is ~2.81 nm /step (at ~0.16 um/volt) that’s so large that the needle will pass into and out of tunneling in only one step. * * 16 bits gives ~0.2747 mV/step which is ~43.9 pm/step, small enough that you can control tunneling with more than one step. * * * 12 bit ADCs (versus 10 bit for arduino/teensy)! * * * the IDE looks almost exactly like the arduino IDE. * * * I’ve spoken to Leaf Labs folks in the past, they’re a good group of quality-focused engineers/artists. * * since sample needs only ~10 millivolts, it’s probably best to just pass the DAC output through a pair of unity inverting amps (don’t remove the DC bias). 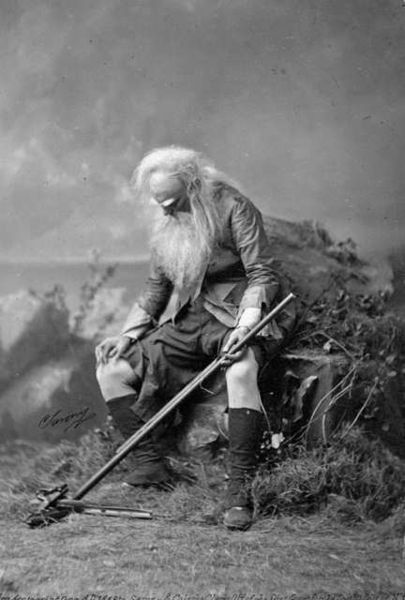 * Is Gwyddion well-regarded in the microscopy arena? * How do you make HOPG / graphene? Is it at all easy? * What is an appropriate sample bias for starting? I saw ~10mV today, but I was going to use ~1-2V, that’s bad. * Is there a market for STM tip-making machines? * What is the process for making an AFM tip? I was notified late Wednesday that I have been awarded the October 2011 grant from the Chicago Awesome Foundation for completing the full prototype of the Scanning-Tunneling Microscope. Their posting is over here. For the record, yes, I officially love the Awesome Foundation. At nearly the same time, Make magazine blog posted an old video of me playing with the version 0.1 electronics and then Element 14 posted as well (wow, I’ve come a very long way since then – I need to shoot some new video), bringing in a flood of new folks over the past 48 hours. Hello new folks! The version 0.1 electronics in the video posted on the Make blog was a poor implementation of a good analog design with a microcontroller slapped to the inputs. I’ve since learned that analog is weird compared to digital, and getting those two worlds to talk properly involves a lot more finesse and art than science and equations (equations do get you into the ballpark, however). I’m nearly done with a complete redesign of the digital and analog electronics (now at version 0.3). The new electronics incorporates nearly complete digital control of the STM (I’m working on ways to further increase the control the microchip has over the STM to include gain control of the many op-amps). Thanks to Idea Petri Dish for the assist on analog circuit design and troubleshooting. With new electronics comes new firmware and software of course, which is in-process. I’ve done a very rough draft of the vibration dampening table design. I’ll be using a classic floating gravestone style table – a heavy slab of material suspended by rubber bands, surrounded by a support structure. It’s not fancy, but it works. I’m working with Bart Dring, of MakerSlide fame to design the rough approach (basically a screw, direct-driven by a 400 step motor and a 1/16th step driver, like the pololus popular with the RepRap folks). I quit my job to pursue my dream of working in the device design industry, so if you’re feeling particularly generous, please purchase a periodic table – 100% of the proceeds goes towards funding this project. If you want to find out when kits are available (soon, I hope), sign up here. Many, many thanks! I can’t easily express how grateful I am for your generous support! I’ve chosen to quit my job to pursue my passion of open source scientific devices, and your support goes directly towards furthering this project. 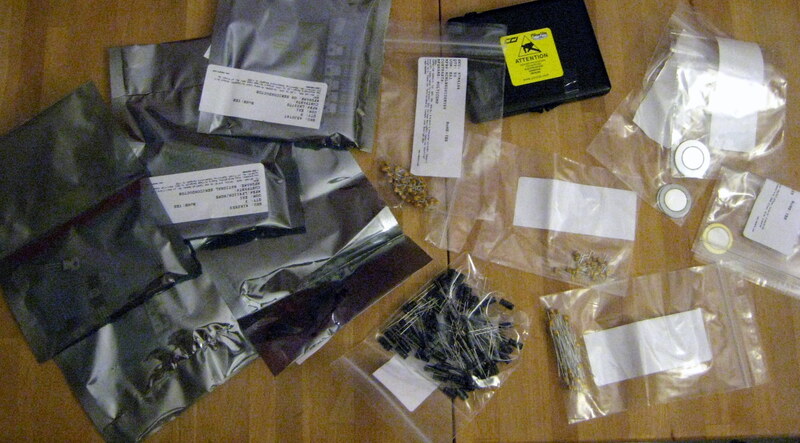 I just received the first visible result of your help – a shipment of components. These are mostly op-amps, voltage regulators (silver bags on the left), capacitors, and piezo disks (clear bags on the right). This shipment will solve several power supply and signal issues – - the +2.5V signal will actually be +2.5V now, significant improvement over the unreliable voltage divider I was using previously. 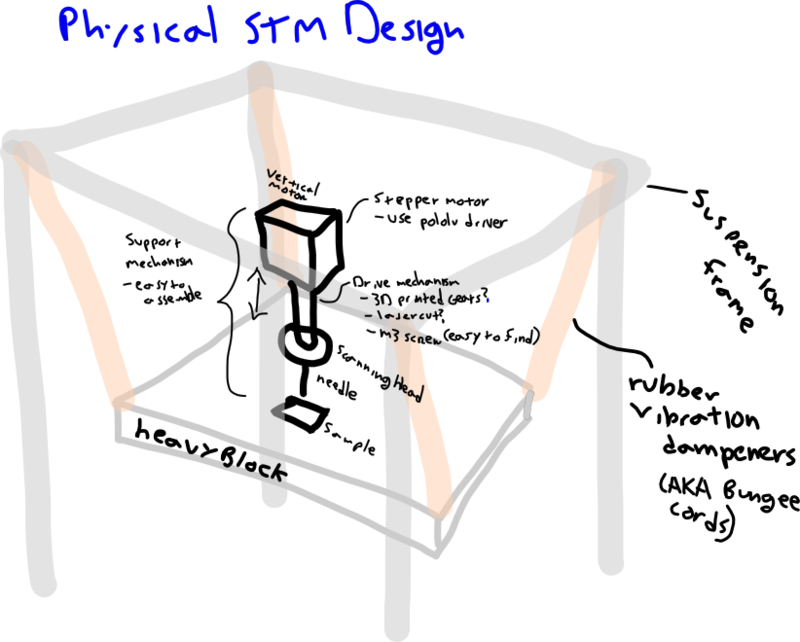 I’ve been mulling over a simple physical design for the STM. My primary design goals are ease of finding parts and ease of assembly. The support structure is an outer support frame with a heavy inner platform suspended by rubber strips for vibration isolation. The rough approach of the microscope will have a stepper motor driving the scanning head towards the sample. I’d like to use gearing to reduce the distance driven per step, and I’ll be using a stepper motor driver capable of providing 16th steps (that’s 0.1125 degrees on a typical 1.8 degrees per step motor). I’ll probably need help in designing the rough approach – any mechanical engineers out there? I have access to a laser cutter and a 3D printer for making gears. Would you like to support the Chemhacker STM project? I’ve been asked this question a few times in the past week – how can someone support the Chemhacker STM project? Here’s the easiest way: purchase a periodic table! I designed them myself, they are accurate to 5 significant figures and even contain Copernicium, the newest element! You can’t do chemistry without a periodic table. So if you’re having trouble combating sentient grey goo, you should support the Chemhacker STM project by purchasing a periodic table! $25 and ship worldwide for free. Please Vote! Open Hardware Scholarship Applicant! I’m delighted to announce that I’m an applicant to the Open Hardware Scholarship. It’s a grant of over $2000 for the completion of an open hardware project. Without going into boring personal finance details, $2000 will allow me to more rapidly push the Open Source Scanning Tunneling Microscope project to the public beta stage. The scholarship award will be chosen by votes, so please visit the Open Hardware Scholarship voting page (I’m the fifth one down on the left side of the page) in the next 24 hours (voting ends September 15th 6pm EST) and vote for the project you feel is most deserving of a grant (hopefully this one). UPDATE 2: thanks so very much for all the votes everyone! Sadly, microscopes lose to hydroponics. Winners list at openhardwaresummit.org. What would you do with an STM? When I started this project, I had only one idea for using an STM: looking at nanoparticles. This is just a quick note: I’m currently breadboarding version 0.3 of the STM electronics – Hopefully I’ll have photos and results shortly thereafter. Thanks to Steve F., and Efrain O. for their extremely valuable input to this revision. Want to know when ChemHackerSTM kits are ready for sale? Please fill out this form. 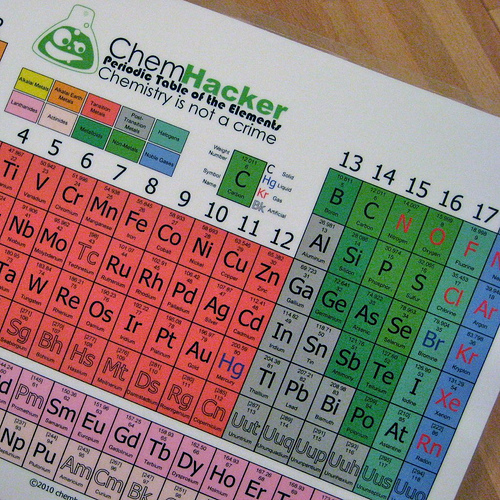 Interested in purchasing a ChemHacker periodic table?